Good Morning! Welcome to the Winter 2017 edition of Freaky Friday! I am so excited to be participating! This group is the brainchild of my friend, Michaela’s and it is SO MUCH FUN! For those of you that aren’t familiar with Freaky Friday, it is a group of food bloggers that get assigned a secret blog and we get to choose any recipe we want to make from it for our own blogs. Then all of the recipes are revealed at the exact same time and we get to see who had our page and which recipe they selected! It has been a great way for me and my readers to find new blogs to follow, and I feel honored to be a part of it! This round, I had the pleasure of cooking from Bowl Me Over Blog! Debra is a serious foodie, dog lover, runner and does volunteer work with some amazing charities. She has gotten TONS of cooking experience by being the go-to girl in her family for years, catering weddings and anniversary parties and in the summer helping to cook mountains of food for her family reunions. She loves to use up the last bits of things in her creations and said many of them end up in a bowl, so that’s how she got her blog name. I thought that was so cute! I have always loved her blog’s name! I had SO much fun browsing BOWL ME OVER and trying to decide which recipe to make first. Some of the ones that immediately caught my eye were her Beef Bourguignon, Bracioli, Mom’s Sunday Gravy, and her Easy Teriyaki Chicken Bowl. But when I saw her Award Winning Bacon-Cheeseburger Potato Soup, I KNEW that was the first one I wanted to make! My family absolutely LOVES potato soup and Bacon Cheeseburgers so it was a no-brainer! You GUYS, words can not express how good this soup is. I know now why it is award winning. We absolutely inhaled bowl after bowl of it and next time, I will double it FOR SURE! I served it with yummy hamburger toasts and I will sharing that recipe soon! 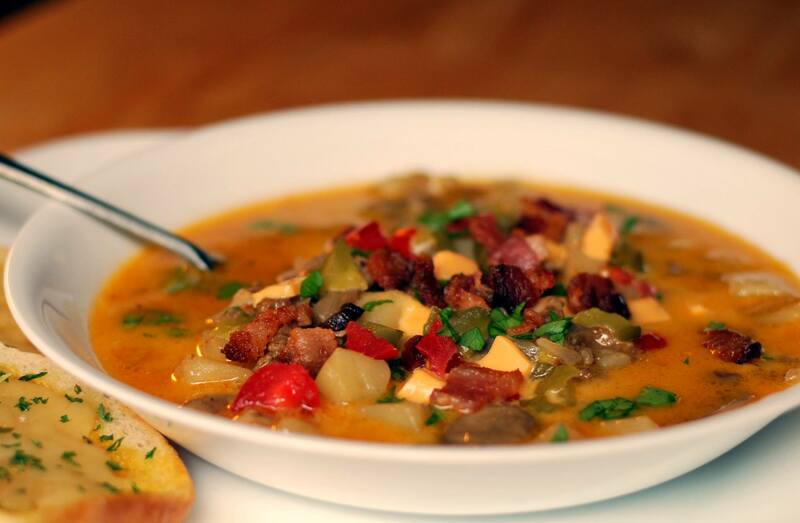 If you love potato soup and bacon cheeseburgers (and who doesn’t? 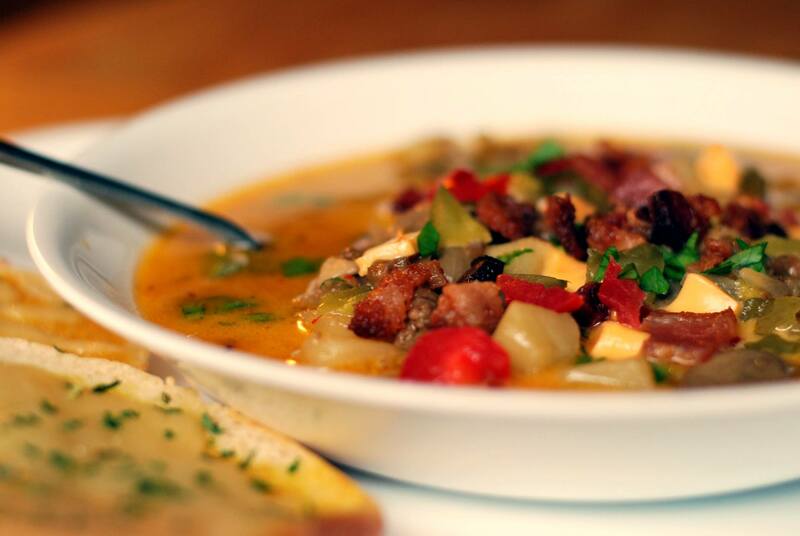 ), you are going to LOVE this soup! Sauté chopped bacon in a large stock pot until crispy. Remove the bacon from pan & drain on a paper towel, reserving drippings in the pot. Increase the heat to medium & to rendered fat add one pound of hamburger, sliced mushrooms and chopped onions. Brown and then remove most of the leftover fat. I kept about 2 Tbsp worth for flavor. Add the minced garlic & sauté until fragrant, about 30 seconds. Turn the heat to high and add the potatoes, beef broth, salt, pepper, red pepper flakes and Montreal seasoning. Boil for 10 minutes or until potatoes are fork tender. Reduce the heat to low & add the shredded cheese and stir until the cheese is completely melted. Garnish with chopped chopped dill pickles, reserved bacon, tomato & parsley. Enjoy! This soup has just about everything in it that our boys seem to live for! With everything that’s in it, clearly it makes for a perfect and complete meal all on its own – what a fantastic idea Brandi! Thanks so much for passing this one along to us! Totally making this soon! It sounds so good! This soup looks fabulous! I can see why your family loved it so much. What a family favorite this will be! Oh my! What a crazy awesome sounding soup!!! I think my kiddos will really enjoy it! Yup, this is definitely a great soup to double the recipe! 😀 So glad you & your family enjoyed it’s hearty deliciousness! Thank you for sharing it for #FreakyFriday !!! This looks like heaven in a bowl. I would definitely need a large bowl of this, it’s such a great combination of flavors! Perfect choice!! My family would devour this one, too! Oh my word this soup looks so good! Loaded up just the way I like it! Wow, this sounds insanely good! Looks like comfort in a bowl. I can just imagine how delicious it will taste when I make a batch. Looks like I have another soup to try! Good thing we still have some cold weather ahead!